I'm not a huge fan of much of the polling that goes in terms of job approval. During the run-up to the election I dissected a lot of polling that felt suspect to me. I argued that the election was not going to be a Hillary Clinton blowout and that it was going to be close, because there was a lot of skewness embedded in the polling results. I wasn't confident in my opinion because the poll internals were not always available. But I was right. So, here we go again. A 2018 projection based on what the polls say right now. 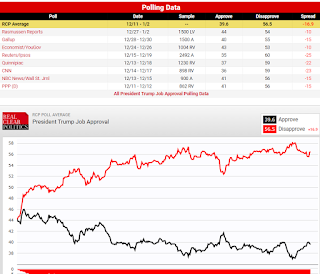 Full disclosure, I used to follow president Obama's job approval ratings from Rasmussen Reports very regularly during his first term, but heading into his second term, I started questioning the polling, many of which had him winning re-election but many of which had him losing to Mitt Romney. That's when my trust in the polls started to falter - 2012. Where the presidential job approval from RealClearPolitics is interesting now though, is a different matter. Yes, the polls are mostly done on registered voters or all adults rather than likely voters (where he performs better, albeit still underwater). 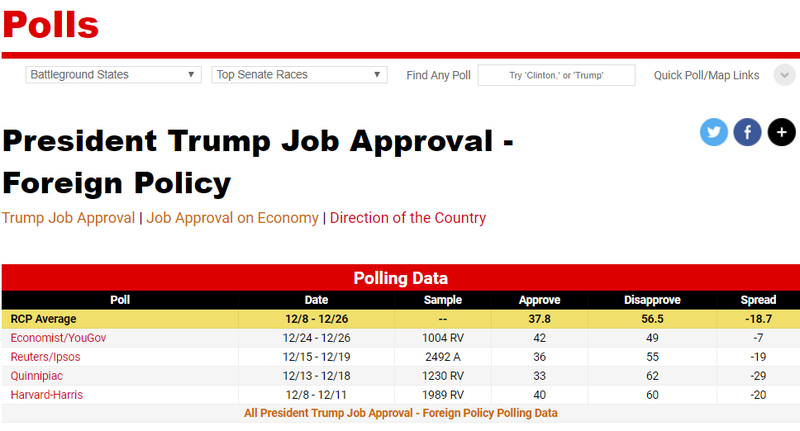 But the site allows for an approval rating on the economy versus on foreign policy, versus overall. That caught my attention today. 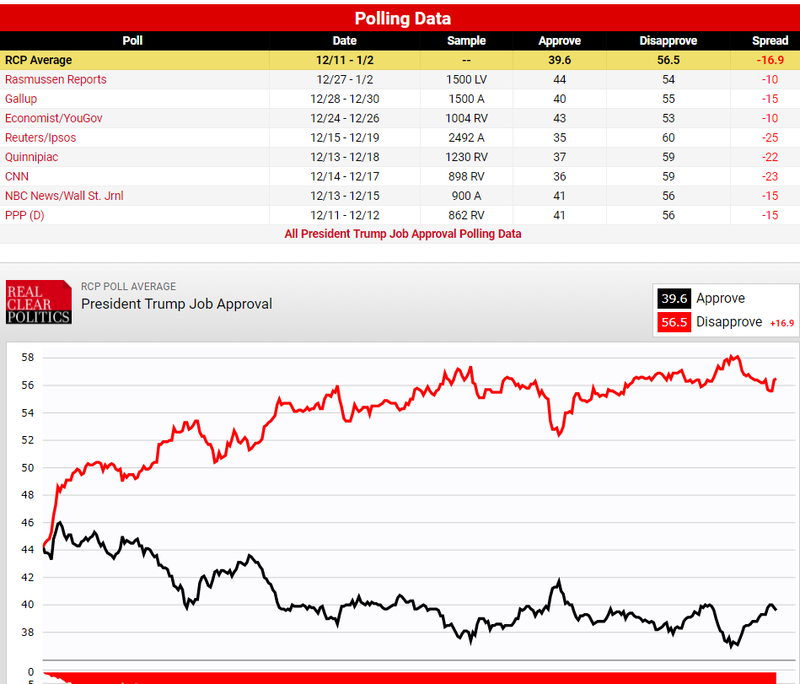 Overall, the averaged polls by RCP show president Trump's job approval is underwater by 17 points, at roughly 40%. The skewness aside, let's assume that's the baseline. You'd expected the drill downs on the issues of foreign policy and the economy to reflect that level and display some correlation to that number. Foreign policy does reflect that. 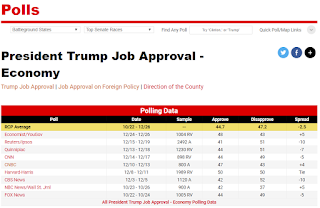 President Trump is almost 19 points underwater on foreign policy job approval at ~38% approval. ISIS has been decimated but there are a number of factors that might explain that - liberals virulently opposed to the Jerusalem decision or improved illegal immigration effectiveness. 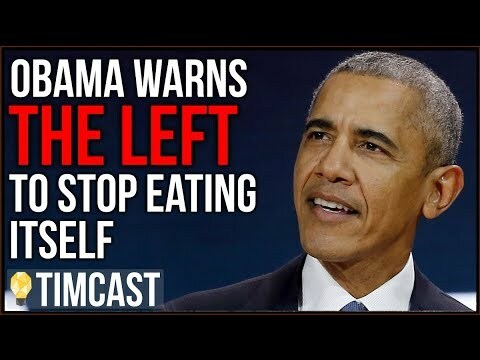 But Iran is a looming problem and North Korea is an existential threat viewed as a Trump problem as it is flaring up on his watch and not his ineffectual predecessor's. And there is a media mob mentality on the Russia issue. So while less than reflective of reality, the foreign policy approval might be skewed in the polls, but it's still feasible that there is validity in those numbers (to a degree). Here's the puzzling piece. President Trump is underwater in job approval on the economy. But just barely. Despite the hysterical claims that the president is blowing up the economy, things are actually pretty good. This before the tax cuts are being seen on people's take home pay. The president is only 2.5 points underwater at this point. That portends a sound performance in 2018 in the midterms if the economy does as well as expected. The president will move into positive territory on job approval re: the economy. You'd expect that to move the dial overall as well over the course of 2018. 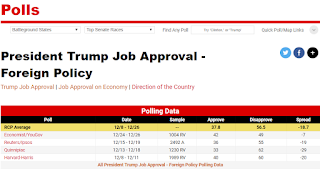 Yet there's an odd finding in this - why is the president's job approval seemingly tied more closely to foreign policy than it is to the economy? After nearly a decade of an anemic economy, you'd think "It's the economy stupid." would never be more apropos. 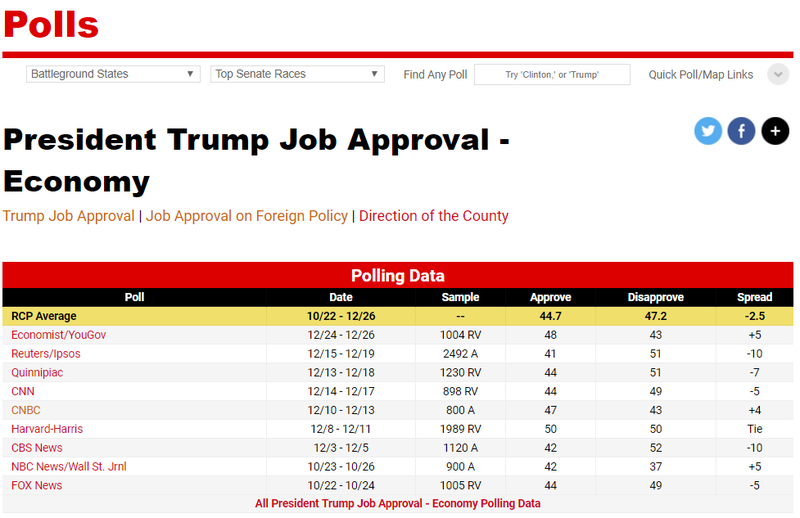 Either the polls are flawed or skewed, or there's a Bradley Effect at play that's under-counting president trump's support. Or perhaps the economy has been de-coupled from presidential approval. Perhaps there's an overriding concern about a lack of presidential demeanor that overshadows the good he has done on the economy. I doubt that, or at least that it's so strong as to drag a -2% to a -17%. But that doesn't pass the smell test. Something is clearly off on these polls.